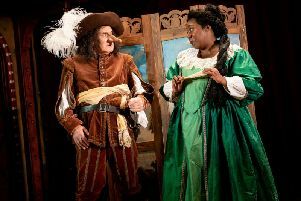 The Arts and Barn Gilbert and Sullivan is putting on one of the duo’s best known show for its 30th anniversary. The Sorcerer, coming to Castle Theatre in Wellingborough, is set in the village of Poverleigh at the 542nd Fete. It is a tale of love, a magic potion, a tea urn and some very intriguing characters. But as with all Gilbert and Sullivan piece, there is always a twist and the tea has chaotic implications for the villagers who fall in love with the wrong partners. The Society was founded in 1987, in the main, by Sue and John Bailey with the show The Pirates of Penzance, which was staged at a local school. Sue continued: “I had the immense pleasure of playing the role of Ruth and I have remained an active member ever since. “The Pirates of Penzance was to be the first of many successful productions, which have their origins firmly based in the wonderful shows of W. S. Gilbert and Arthur Sullivan. Carole Hanson succeeded as director and produced an updated version of The Sorcerer, which was wonderfully received by our audiences. It was such a hit that the committee chose to revisit this show, as its main production this year with Carole at the helm. Six members remain from the original cast with two members reprising their roles. Carole has been a stalwart member for the Society directing marvellous fresh shows for the last 16 years. The society moved to The Castle, now Castle Theatre, in 1995 and afforded the society an opportuinty to play to larger audiences. Tickets for the show cost between £5 and £15 with three performances, one on Saturday May 20 and two on Sunday May 21.